Chemical contaminants are a major concern for the food industry. Chemical contaminants and residues in food provides an essential guide to the main chemical contaminants, their health implications, the processes by which they contaminate food products, and methods for their detection and control. Part one focuses on risk assessment and analytical methods. Gas chromatography and mass spectroscopy techniques for the detection of chemical contaminants and residues are discussed, as are applications of HPLC-MS techniques and cell-based bioassays. Major chemical contaminants are then discussed in part two, including dioxins and polychlorinated biphenyls, veterinary drug and pesticide residues, heat-generated and non-thermally-produced toxicants, D- and cross-linked amino acids, mycotoxins and phycotoxins, and plant-derived contaminants. Finally, part three goes on to explore the contamination of specific foods. Chemical contamination of cereals, red meat, poultry and eggs are explored, along with contamination of finfish and marine molluscs. 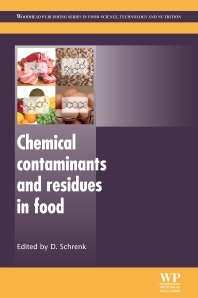 With its distinguished editor and international team of expert contributors, Chemical contaminants and residues in food is an invaluable tool for all industrial and academic researchers involved with food safety, from industry professionals responsible for producing safe food, to chemical analysts involved in testing the final products. Professor Dieter Schrenk leads a research team at the Institute of Food Chemistry and Toxicology at the University of Kaiserslautern, Germany. Professor Schrenk has published extensively on a wide variety of topics within food science, with particular focus on health-related effects of food ingredients.